Amelia Noël-Elkins of University College is the recipient of the Stan and Sandy Rives Excellence in Undergraduate Education Award. She will be honored at the Founders Day Convocation on February 21. 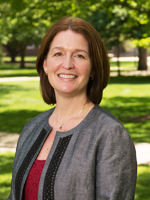 Noël-Elkins received degrees from Harvard and Radcliffe Colleges, and her master’s and doctoral degrees from Indiana University. She joined Illinois State University in 2005 as director of University College. The goals of University College include helping students make a successful transition to higher education and to achieve educational goals and academic potential. As director, she oversees programs critical to the success of our undergraduate students such as academic advising and tutoring services at the Julia N. Visor Academic Center. A leader and innovator, Noël-Elkins’ and her staff have developed a success skills course for new at-risk students and have worked with the Career Center to develop a new course linked to a broader perspective of major and career choice. The Preview program has been a key component of the university’s success in enrolling students. Noël-Elkins’ support and commitment to first-generation students is also evident through the success of TRiO, MSAI Mentor, LSAMP and University Scholars programming. Transfer students, too, have benefited from her leadership as Noël-Elkins has developed and taught a transfer student seminar in addition to revamping Transfer Day options. Noël-Elkins’ service philosophy is that the primary focus of an institution of higher education should be the academic and personal success of students. Students, faculty and staff have an obligation to foster an environment where students from all backgrounds have the opportunity to succeed. This philosophy was developed through her over 20 years of professional work focusing on retention and academic success of students from a variety of backgrounds, particularly those students traditionally underserved by higher education.